Trevor McCarthy, Maryland's leading rider in 2014 and 2016 and coming off back-to-back meet championships, coasted home an 8 ½-length winner in the ninth-race finale aboard 3-5 favorite True to Jeanine to complete a five-win afternoon Friday at Laurel Park. Midwest Thoroughbreds' True to Jeanine ($3.40), a 3-year-old filly making just her second career start and first since Dec. 22, ran six furlongs in 1:12.81 over a main track rated good to capture the $22,000 maiden claimer for fillies and mares 3 and up. The 24-year-old McCarthy returned to the Maryland circuit last fall after moving his tack to New York to begin 2018, and captured Laurel's fall meet title with 45 wins. He followed up with 53 wins to take Laurel's winter 2019 stand, and leads all riders at the spring meet with eight wins from 19 mounts. McCarthy's first win Friday came aboard Maynooth ($3) in Race 2, before he swept the final four races on the card with Tbtwelve ($10.80) in Race 6, Moon Virginia ($18.20) in Race 7 and Cover Photo ($9.20) in Race 8 prior to True to Jeanine's triumph. 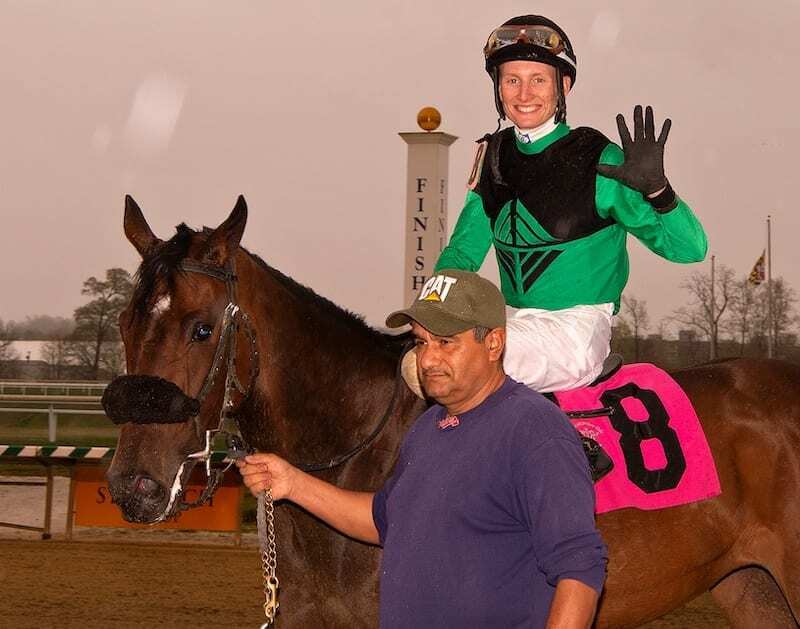 Multiple stakes-placed mare Moon Virginia, making her 35th career start and third since being claimed over the winter, picked up the first win for her new connections and spoiled stakes winner Goodonehoney's Maryland return in Friday's featured Race 7. Sent off at 8-1 in a field of seven led by even-money favorite Goodonehoney, Moon Virginia covered one mile in 1:38.61 to capture the second-level optional claiming allowance for Maryland-bred/sired fillies and mares 3 and older. Trained by Dale Capuano, Moon Virginia rated in second to the outside of pacesetting Oxhilirating through fractions of 24.53 and 47.64 seconds. Goodonehoney, winner of the 2018 Weber City Miss Stakes who went 10 months between races before returning last month at Parx, tracked along the inside in third before being swung three wide leaving the backstretch. Moon Virginia wrested the lead from Oxhilirating once straightened for home, going six furlongs in 1:12.91, then continued to separate from her rivals through the lane as 35-1 long shot Mzima Springs got up for third with Nyx Warrior fourth. Goodonehoney was unable to keep up with the front-runners and dropped back on the far turn, finishing sixth. See You Stable's Moon Virginia, claimed for $35,000 out of a Jan. 11 win at Laurel, was beaten a half-length by Nyx Warrior after dueling with Oxhilirating in her previous start. She also finished second first off the claim, Feb. 28. Moon Virginia now owns seven career wins, six of them coming in 22 tries at Laurel, and pushed her bankroll over $300,000. McCarthy has been aboard the 6-year-old daughter of Jump Start before, including a win last November for previous trainer Hamilton Smith. This entry was posted in NL List, People and tagged Jockeys, laurel park, scotty silver, trevor mccarthy by Press Release. Bookmark the permalink.